A couple of pilot friends started already yesterday, but for me it was today: the opening of the Finnish summer flying season. We gathered around noon at our Kiikala airfield and quickly prepared the towing setup. Juho K. was the first to go; he had to search a bit but just before coming in to land found a nice thermal. The same thermal caused quite a strong backwind at our start so the rest of us had to wait a while. It is very typical at our airfields that thermals are triggered somewhere near the middle of the fields, especially if it has 2 runways that cross each other. No matter where, i.e. at what end, the start is set up, you will have wind from the back. Patience, and timing, are important, the trick is to be ready to launch when winds are nil, or light from the side or front. Often when you start the tow in a clear head wind the thermal is behind you and most of the tow will be through sink which when sufficiently bad will leave you with far too little altitude to fly back into that thermal. I was next in line and lucky to time it right as I hit a nice thermal right near the end of the runway, at the end of my tow. Conditions were very nice, with thermals that took me up to about 1600m at 4m/s. Only close to the strong inversion at that altitude was the air truly turbulent. As the winds up high seemed light I decided to try a smallish triangle, as an exercise. The first leg went very nice but the second leg into the wind was much more difficult than I'd expected. Sink was quite strong, but the real problem was that below 900 m the wind had picked up. On what would be my last glide I slowed down to less than 20 km/h once I was a bit lower, while still in 5m/s sink. I only just made it to the field above which I'd hoped to find a thermal. I arrived with only 50m altitude, too little to search for a thermal. A bird showed me one nearby but I was too low to go there. So after exactly one hour I was on the ground (flight track). Very happy though as it was my first flight in months, and after several weeks of bad flu my first day out. Even the walk out to the main road was a joy, in sunny warm weather. 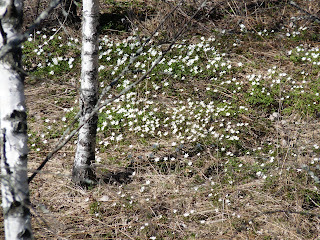 On a hill close to where I landed I saw a colony of wood anemones, a sure sign of spring in Finland. Efka had planned to fly the calmer late afternoon and picked me up along the route, thanks! After a detours she'd also found Juho who had flown a more straight downwind track and had landed some 20 km from me. Sounds truly magnificient! Could you please tell some details about your flight in EFHV a day later? Noobies might benefit of your expertise..